Traces of tetrachloroethylene, also known as perchloroethene or PCE, have been found in the underground stream and groundwater near a U.S. Forces Korea base. The findings follow the discovery of small traces of dioxin in the groundwater there, apparently as a result of the dumping of the lethal defoliant Agent Orange at Camp Carroll in Chilgok, North Gyeongsang Province. PCE, chiefly found in solvents, is a carcinogen that attacks the nervous system and can cause reproductive problems. A spokesman for a joint Korea-U.S. team that is inspecting the area said Thursday, 0.026 mg of PCE per liter of water was detected in a groundwater well in Waegwan, one of the underground streams in 10 areas the team inspected. The amount exceeds the 0.01 mg acceptable level for drinking water. It has yet to be determined whether the pollutant came from the camp. The Chilgok regional government sealed the well on Wednesday. 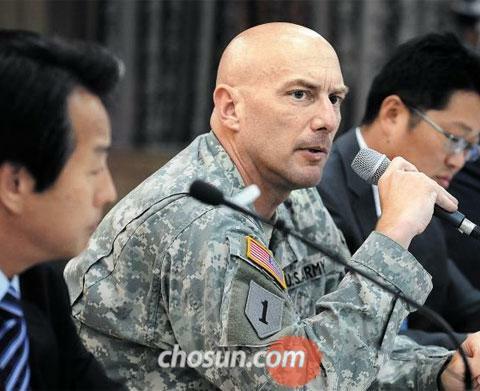 The head of the U.S. side of the joint Korea-U.S. investigative team (center) answers questions from reporters during a press briefing on the results of the investigation into underground water sources near Camp Carroll in Chilgok, North Gyeongsang Province on Thursday. The groundwater drawn from a depth of 110 m has been drunk by about 300 residents at an apartment complex since 1992. The Chilgok government, which assessed the quality of groundwater since 2008, said PCE levels there never exceeded the acceptable limit. A central government official said health check-ups for local residents are in the works. About 0.001 to 0.01 pg of dioxin per liter of water was found in three of the six underground streams subject to the probe, far less than the drinking water quality standard in Japan of 1 pg or the U.S. of 30 pg. The team said the amount is negligible. The team is now analyzing soil samples taken from 14 areas near Camp Carroll. Results will be out around July 15. "Dioxin concentration tends to dwindle by half two to six years after it is buried in the soil, and 2,4-Dichlorophenoxyacetic acid (2,4-D) will decay completely in the environment in a few months," the official said. "Most of the chemicals may already have decayed" since the Agent Orange was dumped at Camp Carroll some 30 years ago, according to U.S. veterans.